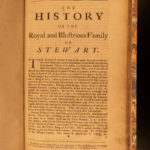 Eighteenth-century Scottish historian George Crawfurd published one of the most important and best genealogical accounts of the House of Stewart. This work features short but thorough biographical sketches of Stewart nobility including dukes and earls, as well as those associated with the family including Kings Charles I and II and King James II. A genealogical history of the royal and illustrious family of the Stewarts, from the year 1034 to the year 1710. : Giving an account of the lives, marriages and issue of the most remarkable persons and families of that name, to which are prefixed, fisrt, [sic] a general description of the shire of Renfrew, the peculiar residence and ancient patrimony of the Stewarts: and secondly, a deduction of the noble and ancient families, proprietors there for upwards of 400 years, down to the present times: containing the descent, original creations, and mos tremarkable actions of their respective ancestors; also the chief titles of honour they now enjoy; with their marriage and issue, continued down to this present year, and the coat of arms of each family in blazon. Collected from our publick records, ancient chartularies of the monasteries of Pasly, Arbroth, Kelso, Dumfermling, Moeross, Balmerinoch, Scoon, Dryburgh, Cambuskenneth, Aberdeen and Murray; and from the best historians and private manuscripts. Edinburgh : Printed by James Watson, on the North-side of the Cross, MDCCX. . First edition.